St Fausta was raised by Christian parents. Orphaned at a young age, she led a strict and virtuous life. Word that she was a Christian reached the governor, and the saint was sent to the eighty-year-old pagan priest Evilasius, who was ordered to turn the saint away from Christ. The girl bravely confessed her faith and was subjected to many cruel tortures. Strengthened by the Lord, she did not feel the pain. They locked her up in a wooden trunk, but the torturers got tired of trying to saw it and burn it in the fire. The holy martyr, and even the trunk, remained unharmed, guarded by divine power. The pagan priest Evilasius was shaken by the evident and manifest power of God, he believed in the Savior and confessed himself a Christian. The eparch Maximus was sent to investigate the matter for the emperor, and he began to torture the old man who had come to believe in Christ. Evilasius turned to St Fausta and asked her to pray for him, after which he bravely endured the tortures. They threw St Fausta to be eaten by vultures, but the creatures would not touch her. The thirteen-year-old girl was pierced with nails driven into her head and other parts of her body. Finally, they threw her into a boiling cauldron with St Evilasius. During this time the martyrs prayed for their torturers. Seeing the faith and endurance of the saints, the eparch Maximus also was converted to Christ, and prayed to God for the forgiveness of his sins. 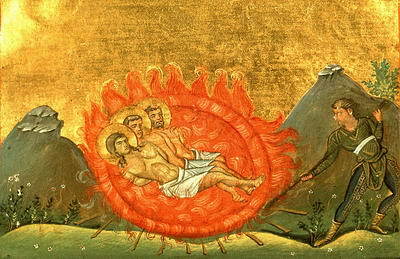 Thrown into the same cauldron in which Sts Fausta and Evilasius suffered, he shared with them the crown of martyrdom. "I love You, my Bridegroom, Bridegroom, and in seeking You I endure endure suffering. for I have offered offered myself in love."